Les Jardins de la Grelinette is a micro-farm located in eastern Quebec, just north of the American border. Growing on just 1.5 acres, owners Jean-Martin and Maude-Helene feed more than two hundred families through their thriving CSA and seasonal market stands and supply their signature mesclun salad mix to dozens of local establishments. The secret of their success is the low-tech, high-yield production methods they've developed by focusing on growing better rather than growing bigger, making their operation more lucrative and viable in the process. 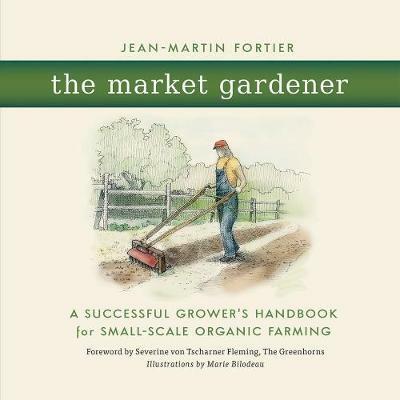 The Market Gardener is a compendium of la Grelinette's proven horticultural techniques and innovative growing methods. This complete guide is packed with practical information on: * Setting-up a micro-farm by designing biologically intensive cropping systems, all with negligible capital outlay * Farming without a tractor and minimizing fossil fuel inputs through the use of the best hand tools, appropriate machinery, and minimum tillage practices * Growing mixed vegetables systematically with attention to weed and pest management, crop yields, harvest periods, and pricing approaches Inspired by the French intensive tradition of maraichage and by iconic American vegetable grower Eliot Coleman, author and farmer Jean-Martin shows by example how to start a market garden and make it both very productive and profitable. Making a living wage farming without big capital outlay or acreages may be closer than you think. Jean-Martin Fortier is a passionate advocate of strong local food systems and founder of Les Jardins de la Grelinette, an internationally recognized model for successful biointensive micro-farming. - Growing mixed vegetables systematically with attention to weed and pest management, crop yields, harvest periods and pricing approaches. As local organic agriculture continues to flourish, young professional growers like Jean-Martin Fortier and his wife Maude-Helene Desroches are leading the way with their innovative ideas about farming. Based on low-tech, high-yield methods of production The Market Gardener is a complete, modern, micro-scale farming handbook which shows that making a living wage growing food without large capital outlay or access to an acreage may be closer than you think. ... ... picks up right where Eliot Coleman has left us, applying many of his core principles, but doing it in such a brilliant way as to provide beginning farmers a solid framework of the information they need to start up and become successful small-scale organic growers themselves- Adam Lemieux, Product Manager of Tools & Supplies, Johnny's Selected Seeds In France, The Market Gardener has quickly become a book of reference for small-scale farming. Both visionary and practical, it is a work of rare intelligence. --- Charles Herve-Gruyer, permaculture teacher and grower at la Fermedu BecHellouin, France ... Jean-Martin Fortier is a passionate advocate of strong local food systems, and founder of Les Jardins de la Grelinette; an internationally recognized model for successful biointensive micro-farming. ...should be of great use to market growers everywhere. AS LOCAL ORGANIC agriculture continues to flourish, young professional growers like Jean-Martin Fortier are leading the way with their innovative ideas about how to start a farm. Growing on just 1.5 acres, he and his wife have been making a good living from their vegetable operation for over 10 years, feeding more than 200 families through their thriving CSA and seasonal market stand. Setting-up a micro-farm by designing biologically intensive cropping systems, all with negligible capital outlay Farming without a tractor and minimizing fossil-fuel inputs through the use of the best hand tools, appropriate machinery and minimum tillage practices Growing mixed vegetables systematically with attention to weed and pest management, crop yields, harvest periods and pricing approaches. The Market Gardener is a complete, modern, micro-scale farming handbook which shows that making a living wage growing food without large capital outlay or access to an acreage may be closer than you think. ... picks up right where Eliot Coleman has left us, applying many of his core principles, but doing it in such a brilliant way as to provide beginning farmers a solid framework of the information they need to start up and become successful small-scale organic growers themselves. JEAN-MARTIN FORTIER and his wife Maude-Hélène Desroches are the founders of Les Jardins de la Grelinette, an internationally recognized micro-farm known for its high productivity and profitability using low-tech, high-yield methods of production. A leading practitioner of biologically intensive cropping systems, Jean-Martin has more than a decade's worth of experience in organic farming. Jean-Martin lives and farms in Southern Quebec, Canada, with his wife and their two children. Can You Really Live ff 1.5 Acres? Relying on Natural Fertilizers - Why?